19 PLATE...... PRICE INCLUDES VAT...... 1 OWNER FROM NEW...... NEW ARRIVAL..... MASSIVE SPEC...... DELIVERY MILES....... OBSIDIAN BLACK METALLIC..... BLACK LEATHER INTERIOR.... DAB DIGITAL RADIO..... 19 INCH DIAMOND CUT ALLOY WHEELS..... HPI CHECK CLEAR..... AUTOMATIC TIPTRONIC TRANSMISSION...... 8 SEATS..... COMAND MULTIMEDIA SYSTEM WITH MEDIA INTERFACE...... REVERSING ASSIST CAMERA...... SEAT HEATING FOR DRIVER AND FRONT PASSENGER...... FRONT AND REAR PARKING SENSORS....... AUTOMATIC TAILGATE...... SLIDING REAR DOORS...... REAR PRIVACY GLASS..... RAIN SENSOR AND AUTOMATIC HEADLIGHT ACTIVATION......BLUETOOTH TELEPHONE PREPARATION..... CONNECTIONS FOR USB AND AUXILIARY AUDIO DEVICES..... STEERING WHEEL MOUNTED CONTROLS..... ELECTRIC/HEATED MIRRORS.....2 KEYS...... PLUS MUCH MORE. 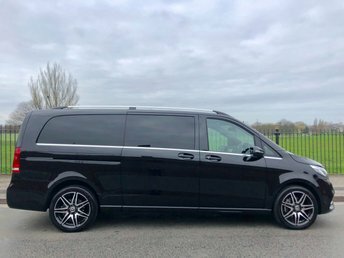 Get the best deal on a used Mercedes-Benz V Class van for sale in Liverpool by making your way to Wavertree Car Centre Ltd today. You'll find every available model listed here on the website, and as all our stock is competitively priced you should have no problem sourcing a pre-owned Mercedes-Benz to suit your budget. Take the opportunity to browse our current range online before contacting a member of the showroom team to find out more. Our friendly and knowledgeable staff will be more than happy to answer any questions and provide advice and guidance when necessary. Alternatively, why not pay a visit to our showroom in person and take a closer look at the selection of used Mercedes-Benz V Class van models for sale.